There is a strange case presented to the Akbar’s court by Mulla Do Pyaza. The main opponents are Teacher Shrikant and a wealthy Businessman. The businessman claim that the teacher have borrowed some amount of money from him which he refuse to return. On the other hand the teacher claim that he have borrowed the money from the businessman but in the dream only. He actually haven’t borrowed money from the businessman so how he need to return it? Akbar says “A really strange case” and he asks both the opponents to provide the details. The teacher says that he himself is a strong supporter of the belief that one should not borrow the money. One needs to learn to live with the lifestyle affordable wiht his income. He used to tell others not to take loans, as the interest grows day by day and sometimes the person will have to pay a very high amount which might not be feasible for him. One night when he was sleeping, he had seen a dream which may be side effects of his deeds and beliefs about the same. In the dream he had visited the businessman to ask for the loan of a significant amount. The businessman felt surprised seeing the teacher at his place, but gave the needed amount to the teacher as loan. When the teacher asked to sign the agreement the businessman told that he trusted the teacher completely and there was no need to have any agreement. The teacher suddenly awakened and feeling uneasy, he woke up her wife and told her about the strange dream he had had. His wife told him to be calm, remove the thoughts of the dream from his mind, relac and sleep. The next day her wife when talking to another lady, had a slip of tongue and told her about the strange dream her husband had had. This tell reached Kallu the barber. He spread it to his customers and adding his own ideas he relayed to others that the teacher might have actually taken the loan from the businessman and now to keep himself away from the truth, which is exactly opposite to what he keeps telling to others (that do not borrow the loan); he might be giving it a face of a dream. The businessman on the other hand told, that the teacher actually came to him to borrow the loan and he had given it to him. One day when he went to the teacher’s home to recover the same, he refused to repay the loan saying that he had never borrowed any money from the businessman. The businessman threatened the teacher that he has the entire village to support his story and he will go to the court. And that is how they ended up to Akbar’s court, i.e., to get justice. Akbar found that both the versions of the stories were equally convincing and it would be tricky and tough to know the truth and take the final decision. He asks Mulla to express his view about the case. At the same time the doorkeeper of the court comes in and asks the emperor that Mahesh Das is on the door and requesting the emperor’s permission to present himself in the court. Akbar, who is an admirer of the wisdom, intelligence and wit of Mahesh Dash, happily welcomes him. When Mahesh Das comes in, Akbar briefs him about the strange case currently running in. Mahesh Das tells that he has heard everything about it, when he was at the door. Akbar then decides to let Mahesh Das evaluate the case and represent his decision about. Mulla opposes it saying that though Mahesh Das is intelligent, this is something related to experience; and justice is always a great responsibility. So the case should be evaluated by the person who has remarkable experience of real life and its factors. Though Akbar reaffirms his decision to let Mahesh Das evaluate the case. Mahesh Dash asks the necessary questions to both the parties, the witness like Kallu and explores the truth. Let’s keep the stuff happened then after out of this post. Who was correct? What was the decision?… there are so many questions but that is something I think you should view on your own. 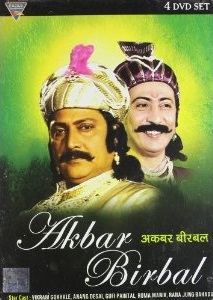 Though I must note that, Akbar was very happy with the way Mahesh Das had analysed the stuff and he told that he found Mahesh Dash is having all the wit and intelligence, that he is brave (Veer – Bir) and having strength (Bal) and hence he is awarding him with the name “BirBal” and that he accepts him in his nine gems. Akbar also presented Mahesh Das with a small state and made him his king (Raja). After this, Mahesh Dash was more popular and mostly referred as Raja Birbal or Birbal. So this is how we got Birbal and the series of lot of witty incidents associated with Akbar and Birbal started.